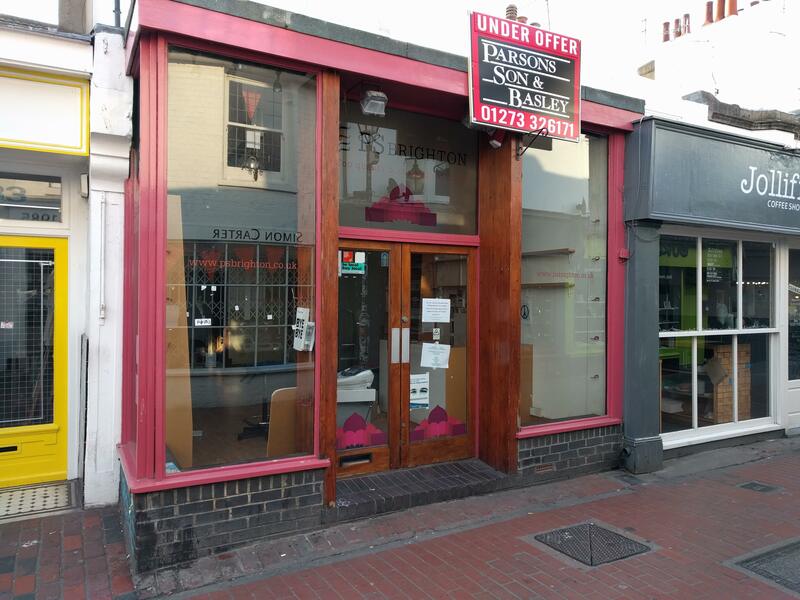 Brighton’s bookshops continue disappearing. 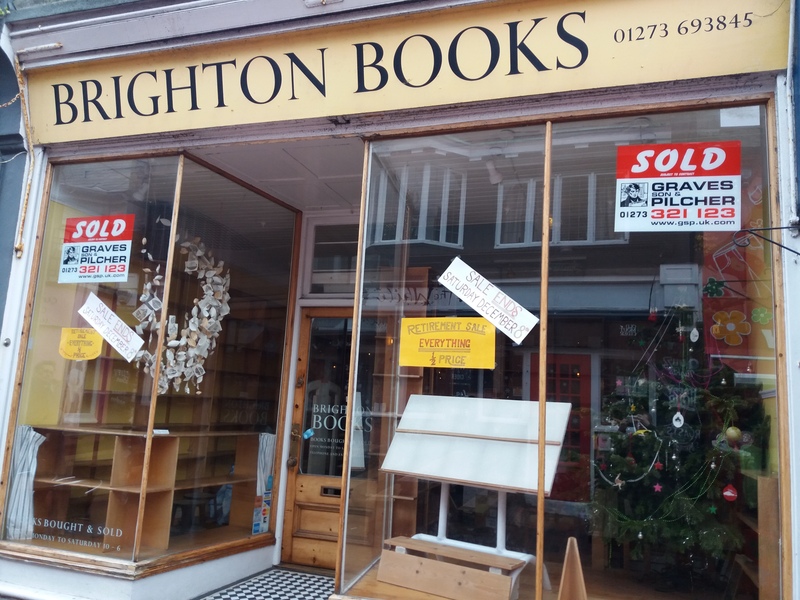 After the sad loss of PS Brighton in 2017, Brighton Books has also gone from Kensington Gardens. And, late last year, Colin Page books quit the Lanes. One of the things I loved about Brighton were the bookshops – enough that I sometimes sneaked away from school to spend a day searching them. Wax Factor continues to offer an amazing stock (and an often-tempting window display) and I hope it keeps going for many years yet. 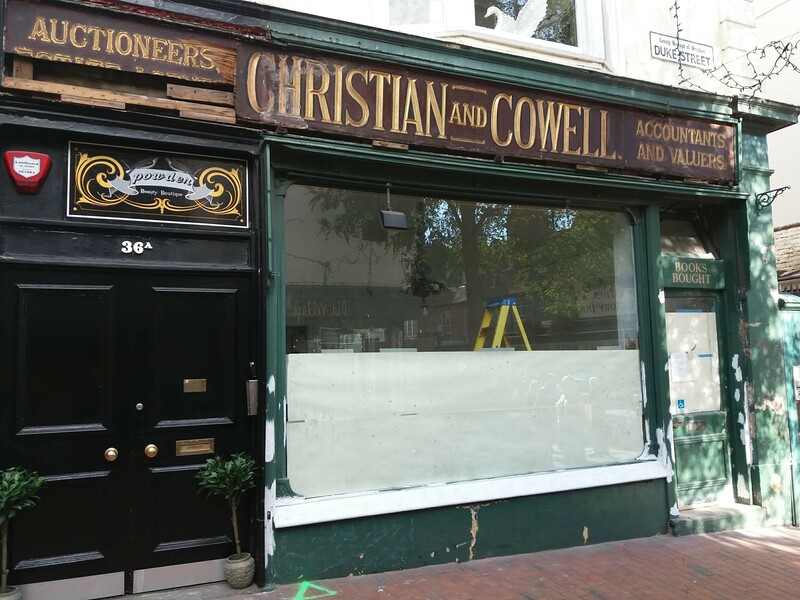 But these are hard times for second hand bookshops, finding themselves hammered by Amazon and charity bookshops, both of whom have a strong advantage in terms of tax. I finished 78 books this year. Looking back, there are still a fair few I’d have been better off abandoning rather than finishing – I still can’t break the habit of finishing books that was drummed into us at primary school. Despite that, I read some very good books, and picking an arbitrary ten means not talking about some of those. My very favourite book this year was Rosy Carrick’s Chokey. Of course I’d say that, since this is a book I have a close connection with, having seen early performances of most of these pieces. All of them I love dearly, but the epic Thickening Water is one I remember from searing performances; and Vanishing Act is one that mentions my running – something I’ve been too injured to do for years and hearing that poem always makes me sad. But Chokey is a very good and moving book of poetry. The 2020 Commission Report on the North Korean Nuclear Attacks Against the United States was recommended on Warren Ellis’ mailing list. It’s a fictional account of a nuclear war, written by Jeffrey Lewis, an expert on the North Korean nuclear program. What makes the book disturbing are the footnotes, showing how the scenario Lewis is describing is a plausible and real danger. I’ve been reading more horror and quite liked The Cabin at the end of the world. It was pulpy book, but read quickly. It describes a family who find themselves on the wrong side of a save-the-world scenario. An Era of Darkness is Shashi Tharoor’s brisk account of the British Empire’s crimes in India. Even having read a lot about India, elements of this came as a surprise to me. Given the resurgence of Imperial pride in Britain, this is a sobering read. Everyone I Know is Broken-Hearted is a collection of non-fiction by Josh Ellis. Some of these pieces I loved at the time and it was good to revisit them in a single batch. Ellis is an incredibly talented writer, and there is fire in these early pieces. Michal Lewis’s The Fifth Risk was heavily excerpted in the Guardian. It’s an interesting view on how government is more than politics, and how much work goes into keeping infrastructure running. In the midst of ongoing austerity it’s sober to see how much money goes into keeping us safe and how easily we take that for granted. Fire and Fury is an astounding book. Wolf has written a fascinating and gossipy account of Trump’s first months in office that reads like a Delillo novel. I read a lot of books on politics this year. New Dark Age by James Bridle was another Warren Ellis recommendation, which also featured in the Guardian. While it reads more as a collection than a single narrative, Bridle has drawn out some striking elements of the modern world. A chunk of Charlotte Higgins’ The Red Thread was also featured in the Guardian. It’s a book about Theseus and labyrinths that wanders through many academic and cultural themes. It was just what I hoped it would be. I saw Raynor Winn talk about The Salt Path at Port Eliot festival and it reduced much of the audience to tears. The book is unavoidably moving but it is also inspiring, the story of someone getting up and embarking on an epic walk against significant odds. This is one of the best books I’ve read on hiking. Wild by Cheryl Strayed is another book on hiking, most interesting for the vividness with which Strayed writes, and the trail culture they describe. Last week, I read Ben Graham’s novel Amorphous Albion. The book is linked into the ongoing Discordian Revival in the UK, which Ben talked about in a recent interview with Historia Discordia. This revival links in with a lot of things I’ve loved for years including British comics, the KLF, and Ken Campbell. Ben has used this rich stew as the basis for an adventure story about the battle between order and chaos. The book is written in a fast-paced pulpy style which reminded me of Michael Moorcock. But it’s also a richer text, with a dense network of associations. I picked up on a lot of them, but I had to pop online to check a few things, such as the Jimmy Cauty image of Stonehenge. I knew I’d love Amorphous Albion from the first page, which includes the line “We came back to earth with all the grace of a floundering car-park”. Ben is a poet, and uses this with fine effect, with some stunning use of language. Amorphous Albion starts out on Brighton beach, with the Hove Space Program, who are devoted to the ‘exploration of inner and outer space’. Something bad has happened to the country; Ben describes how the i360 “lay on its side, half-submerged in the pebbles like a downed flying saucer”. The book heads out from Brighton on a tour of the country. It describes the fate of commuters at Three Bridges, what happened to Glastonbury, and Stonehenge overrun by military camps of Salisbury Plain. Lord Andrew Eldritch makes a cameo as the Raven King. You don’t need to know about Robert Anton Wilson or the KLF to enjoy things like Ben’s theory on the 5th Beatle, which is sublime. But there are some lovely references, such as the way the 1992 KLF Annual becomes important to the plot; or the importance of Sheffield’s connection to Brighton. It’s also great to see mention of Wonderism. Wonderism is the opposite of terrorism. There’s increasing terrorism in the world — to counter than, we have wonderism, which is random acts of joy…re-enchanting the world, making it seem strange and wonderful again through various artistic acts. Ben has been working on some live performances of the book, including one at last year’s Superweird Happening. There was another one in Glasgow this weekend, and hopefully I’ll catch one in Brighton soon. (I missed the one last April to watch the Sisters of Mercy in London – very much the wrong decision). While I’m cynical about some aspects of the Discordan revival, works like this make me authentically excited. While it does hark back to RAW and the KLF, there is enough new raw energy here to make it worth reading. Having a simple goal on my bucket list means I can easily work towards completing it, and this week I started on Le Carré’s complete works. I first got into his books while I was a teenager, mainly through the famous novels – the Spy Who Came in from the Cold and the Karla trilogy. I loved the weary cynicism of the books, and how they felt like they were plotted backwards; they started with a climactic event, then followed the after-effects. After the cold war, people speculated that Le Carré’s work would suffer. Instead his books have focused on often-forgotten, ongoing aspects of espionage. For example, Our Kind of Traitor examined accusations that financial institutions laundered illegal money during the financial crisis when little money was available to loan. I’ve missed several of the later books, so reading the full set is a chance to fill in the gaps. It’s also an opportunity to approach some books I’ve loved as a different person. Le Carré’s first book is set in a very different world. Call for the Dead, was published in 1961, just 16 years after World War 2 and the Holocaust. It’s set in a very different Britain. London is still a working city rather than the shiny thing it has become; the Beatles are in Hamburg, yet to sign to Decca, the Swinging Sixties some time off. It’s not a state of the nation book, but the country it describes does feel very different. The book opens with a description of George Smiley: “When Lady Ann Sercomb married George Smiley towards the end of the war she described him to her astonished Mayfair friends as breathtakingly ordinary.” Smiley has an uncharismatic appearance, and is often compared to animals, “His appearance seemed to reflect this discomfort in a kind of physical recession which made him more hunched and frog-like than ever. He blinked more, and acquired the nickname of ‘Mole’.” He’s a friendly, competent and loyal chap, but strangers often dislike him, “a little fat man, rather gloomy” as one sees him. Call for the Dead is a murder mystery. Smiley undertakes the routine interrogation of Samuel Fennan, a Foreign Office worker. The interview is friendly and positive, but the next day Fennan kills himself, saying his career is ruined. Smiley is sent to speak to the widow Elsa, to see if he can work out what happened. While at the house the phone rings; thinking the call is for him, he takes it – a reminder from the local exchange, which had been placed by Fennan before he took his life. This leads Smiley to question the death, slowly unravelling something more complicated than a suicide. The book describes the contradictions of Smiley’s role in a bureaucracy, “the unreality of containing a human tragedy in a three-page report“. At one point Elsa attacks him for the way the establishment drops bombs but “don’t come down here and look at the blood, or hear the scream“. She is unaware of the pitiful fear in which Smiley spent the war, and he won’t tell her any different. He struggles to maintain a core of humanity while, as Elsa puts it, “the files grow heads and arms and legs, and that’s a terrible moment“. The book is interesting but didn’t quite feel like a Le Carré book. While Smiley spends a lot of time away from the action in a hospital bed, he does encounter a mysterious assailant. Despite some beautiful passages, the writing is clumsy in places – Smiley sinks into unconsciousness to end scenes, and the plot is dumped on the reader in an explanation near the end. But Call for the Dead did include one of my favourite tropes of spy novels – the interview with Fennan was conducted in a park while feeding the ducks.I had a sense of deja-vu as I read, the bleak London seeming familiar. It turns out that I read it back in 2011. I’m not sure it justifies reading twice and I might not have finished it, were it not the first book in the series. Next up: A Murder of Quality, which I’m fairly sure I’ve not read before. It sounds like another mystery, but let’s see how it goes. I know there are some great books to come, so I can be patient. As far as I remember, Seveneves gave me worse nightmares than any book I’ve read in life. Not bad for a book that’s horror rather than sci-fi. I read a lot of apocalyptic fiction, but the image of the moon exploding and destroying the earth with debris was incredibly potent. When I first started blogging, about 15 years ago, I decided that I shouldn’t write negative things. This is a good rule and one I’ve rarely broken. But… I read two truly terrible books by once-great authors: Clive Barker’s Scarlet Gospels and Make Something Up by Chuck Palahniuk. It wasn’t that these were bad books – I’d have just ignored them otherwise. I was shocked by mediocre work from such great talents. So far in 2017 I’ve read 45 books, although I expect to catch up on 2016 after my Autumn holiday (I have a load of Le Carre books waiting on my Kindle). Likely best-of-the-years include Chalk by Paul Cornell, John Higgs’s stunning Watling Street (a review is currently in my drafts folder), and I hate the internet. But I’m desperate for a few more mindblowing ones. Recommendations welcome! I spent several years living in Harlow. It’s a place I loathe. I would gladly see it evacuated and used for military target practise. Or just left empty to collapse as a warning to future generations. I can only think of two good things about Harlow. One was the Parndon Woods, which were large enough to that I could pretend that the town was far away. The other was the library. As a teenager, with little money and lots of curiosity, the library was vital to me. Nowadays, the Internet would do the same job and do it better but, back then, the library was the only access I had to interesting culture. I could borrow tapes and listen to indie bands I’d read about but nobody at school was listening to. I borrowed the first Manics album and Dinosaur Jr’s Where You Been from there. I had to order Naked Lunch in from another library. I’m not sure I understood it then (I’m not sure I get it now) but I had a chance to grapple with it. But my favourite thing was the shelf of horror fiction. A run of anthologies, such as the Splatterpunks collection, and various Best New Horror anthologies. When I was a child, I thought that the reason horror films were 18-rated was that they would send a young mind mad. This was an easy impression to get from the video nasty panic that ran throughout my childhood. Horror seemed dangerous and forbidden. I read the back-cover blurb of books in WHSmith with dread. The first horror story I read was Ray Bradbury’s The Small Assassin at 11 or 12. I found it incredibly disturbing but, at the same time, I was amazed by the profound effect it had. All the best horror stories have that physical thrill of sensation. Clive Barker’s In the Hills, In the Cities is one of the great short stories, and gains power from the grim imagery. The Best New Horror series introduced me to some great writing. In writing horror, many of the authors pushed the boundaries of language and imagery. Secretly, of all my literary ambitions, the strongest is to become a horror writer. I loved those stories, some of them so very well crafted. I’ve no love for Harlow. If someone told me they were going to use it for nuclear testing, I’d celebrate that. I can afford to buy my own paperbacks now – I just don’t have as much time to read. Those few shelves in the library weren’t part of the new town plan, but they are the only bit I thought worthwhile. I first heard about Jarett Kobeks’ novel “I hate the Internet” from John Higgs, who told me about the book’s comparison between corporations making money from user-generated content and the publishers that stole from Jack Kirby. As the book puts it, “The business practices of the American comic-book industry have colonized Twenty-First Century life“. Kobek goes on to say that “The only difference being that Marvel, like, you know, actually paid Jack Kirby before he was screwed. Twitter didn’t pay its creators.” John described the book as being more of an argument than a novel, but it appealed to me. It’s also apparently the first self-funded book to be reviewed in the New York times. The book explicitly claims that it is a bad book: “The writer of this novel gave up trying to write good novels when he realized that the good novel, as an idea, was created by the Central Intelligence Agency. This is not a joke. This is true.” As Kobel explains, “the CIA funded both The Paris Review and the Iowa Writers’ Workshop, the latter the prototype of a swarm of creative writing courses” Vice recently published an article, How the CIA infiltrated the world’s literature, which gives some background on this. I read the book in one go. It’s the sort of novel I love, falling into the category described by David Shield’s Reality Hunger, blurring non-fiction with fiction. It’s also very much a meta-fiction: one chapter is abandoned in favour of a summary of the arguments it was meant to make. It’s written in a similar mode to Kurt Vonnegut, albeit more cynical (there is even a science fiction writer among the characters, with the plots of his books described). There is a definite danger in how social media overwhelms our communications and culture. In 2017, having a blog feels anachronistic. As Facebook, twitter and Medium expand, content gets boosted according to how well they achieve these company’s aims. A good example of this is the article The Three Reasons Youtubers Keep Imploding. I’m not sure what the answer is, although the Indie Web offers a glimmer of hope. Maybe the future is zines, maybe it’s something else. By the end of the book I felt quite despairing, and emailed John Higgs to tell him so. And, he reminded me there are good things about the Internet, and Kobel’s critique is not the only way of looking at things. “Pessimism is easier, of course, but pessimism is for lightweights”. we live in a very dark moment where if you want to be part of any extended conversation beyond a handful of people, you do have to sign on to some things that, ultimately, are very unpalatable. Every era has its unanswerable questions, so maybe the thing to do, which is what I did in the book, is to just acknowledge the inherent hypocrisy of all of it. Though maybe that’s an easy dodge. 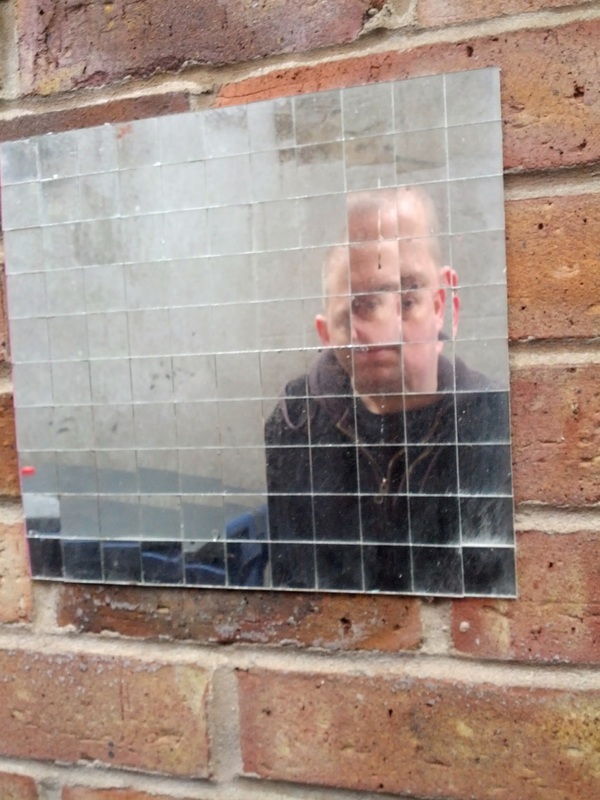 Paul Cornell’s recent novel Chalk is about abuse and folklore and the magic of pop-music. It’s the sort of book that burrows deep into my obsessions (one of its reference points is the Long Man of Wilmington). There’s a lot I can say about this book, and the conversations I’d have in person are very different to what I’d write in a blog post. It’s a book of complicated thoughts and feels. I heard of the book through an interview with John Scalzi. It proved as shocking as Cornell warned – the incident at the start of the book, which triggers what follows, is very hard to read. 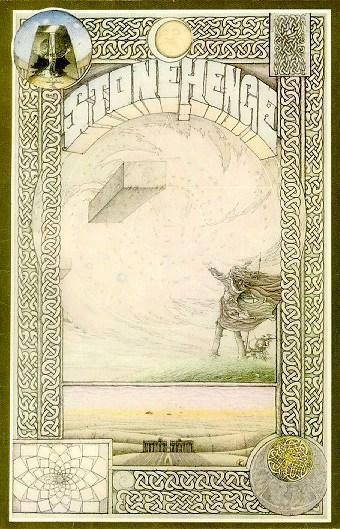 The book contains powerful chains of symbols – chalk outlines, downlands, pre-Roman Britain. There are the tarot suits scattered throughout the story – are the snooker cues wands, the knife a sword? Chalk turns up in different forms, not least on the snooker clues. Cornell described the book as being about narrative, and the character of Angie has her own form of magic, very different to the narrator’s. The idea of pop music as magic seem familiar from Kieron Gillen’s Phonogram universe, but Cornell’s take on the idea is fresh. It’s a magic of lyrics, where the record at number one tells you what is coming in the future. Bananarama becomes a sort of triple goddess of young one, serious one and leader, but “They’re missing someone. There should really be a secret fourth member, or one we only hear about later”. Reference books listing British pop charts provide birth charts. One thing I particularly liked was the headmaster’s announcement “[School] is a microcosm of the world. We prepare you for your place in it. History has set out a path for you. We lead you along it” – the school here is a world where the narratives compete. The distortions to this world are grounded while having the scale of cosmic horror, again reminiscent of Pratchett – there is a danger of something breaking through. I’ve spoken mostly about the mythic aspects of the book. There’s also some very good, very raw writing about the effects of bullying and abuse, about the way in which these things persist in the world. The ending is the right one, true to the book, but it’s far from the one I wanted. But that’s the sort of discussion that works better in person than in books. Louise said there was chalk in every room now.